If you're interested in a chic western look with an urban twist, today's camouflage cowboy boots just might fit the bill. With the increasing emergence of intermingling fashion genres, urban and western styles meet in footwear with styles like camouflage cowboy boots. Famed musical group Big and Rich was pivotal in starting the music now referred to as "hick hop" -- a combination of urban and country music influences that meld together in a new way. It should come as no surprise, that just as the lines have blurred in terms of music, there is a heightened awareness of this concept in the fashion world. Another concept that related to the popularization of new styles like camo cowboy boots is the original prevalence of camouflage gear and apparel for outdoorsmen and women. While western-style boots and camo apparel are often used today for their aesthetic appeals, they originated with functional purposes -- camouflage was not fashion-oriented, but used as an important disguise or concealment tactic for armed hunters, outdoorspersons, and armed forces personnel. As the fashion world experimented with camouflage and western themed footwear, however, both of these styles have come a long way from being merely functional. Today, cowboy boots and camouflage make a statement: they are more likely to get you noticed than serve as something you can hide behind. The Ariat Gem Baby Camo Boots, available at Shepler's, are rhinestone studded women's cowboy boots that combine black crackle leather with a camouflage shaft for a fun look with a hint of glam. With their stable footbed and patented Evelon outsole, these boots are as functional as they are flirty. Cabela's offers the Ladies FatBaby Camouflage Boots. With a central camouflage design and detailed brown leather shaft, these boots also feature lightweight, comfortable outsoles for looking and feeling great. These Lace Up Boots are mid-calf high and are available at SensualSurprises.com -- a sexier version of the western boot, with a stiletto heel and pointed toe. For men, the Rocky Aztec Wellington Boots in Camo are rugged, waterproof work boots that have great camo and leather styling. These boots are designed to cushion feet and provide traction. Available at Walmart. The Western Chief Rain Boots, with a simple western style and fun camo print at Shoes.com. JM Cremp's offers adorable Old West Toddler Camo Shaft Cowboy Boots, made from soft leather. The Ariat Workhog in forest green and brown. The Corral Women's Multi-Colored Snip Toe Western Boots -- a cowboy boot confection in brown, green and turquoise. Finding camouflage western boots takes a bit more effort than other types of cowboy boots, but a little searching may pay off. Major footwear retailers, like Zappos.com, may yield results for various fashions in western boots. 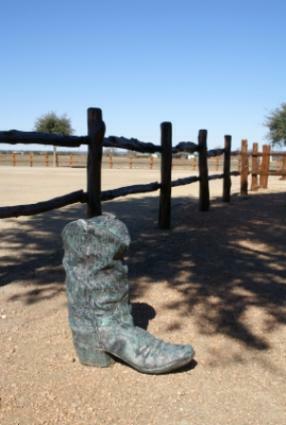 Stores specializing in western footwear and/or apparel may also have offerings in this particular type of boot. If all else fails, consider having a custom-made boot with your specifications in camouflage.